The First Congregational Church of Silverton is one of the oldest Congregational Churches in the State of Colorado. It was established November 24, 1878 with Harlan Page Roberts and seven members of the community. It has served the valley continuously ever since. The first services were held in the schoolhouse, with parishioners being called to worship by Harlan beating out the call on a saw blade. On July 15, 1880, the three lots for the sanctuary were " donated" by Mrs. Wetzel and Mr. Slaymaker for one dollar and Mr. Bowman for fifty dollars. Work began on the sanctuary on July 26, with the cornerstone formally laid on August 20. The sanctuary was dedicated on July 10, 1881 at a cost of $4,500.00.The entire community donated for the building of the church. Professionals, merchants, miners, innkeepers and gamblers alike put their monies in the pot. Harlan even put in $800 of his own money. In October of 1881, the Sunday school purchased a bell for the church and F.O. Sherwood designed a wooden platform for it. The Honorable J.A. Porter donated the lot south of the sanctuary for the parsonage, which was completed in January 1884. The steeple was added to the sanctuary in 1892, giving the building the distinctive silhouette you see today. Traditional church pews were installed in the sanctuary and the ladies of the church gathered to sew cushions for the uncomfortable seating. However, this proved to be such a disaster, that in 1887 the pews were removed and were replaced with opera chairs, which remained until 1961. Our church acted as the "host" sanctuary for most of the various religions as they settled in Silverton. 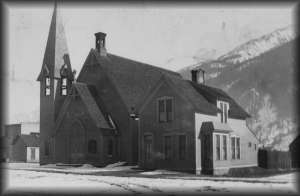 The first Catholic Mass in Silverton on December 24, 1882 was held in our sanctuary. The Episcopal Society regularly met in the church. The Baptist church also held services in the sanctuary. The building has also been the site of many municipal and cultural groups. Historically, the Theater Group and the Great Western Rocky Mountain Brass Band have used our sanctuary for practices and rehearsals. J.W. 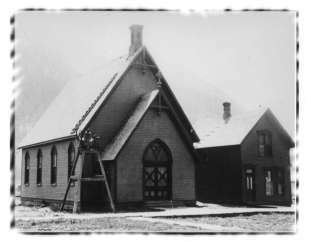 Picketts was sent to bring Congregationalism to the San Juan basin in 1878. With help from all this was accomplished. Harlan Page Roberts, the first full time minister, arrived in July 1878. He was young and energetic, working endless hours to make the sanctuary a reality, investing both time and personal finances. Motier A. Bullock, our first married minister, came in 1883 with his wife Cassie and two children. Rev. M.M. Tracy arrived one Sunday morning in 1886 to find the church locked to bar his entrance because of a running feud with the congregation. In 1886, Rev. C. H. Cook surprised the congregation by accompanying the choir with his violin, thus perpetuating the church's reputation for fine music. L.B. Voorhes was theologically the most liberal minister to date (1891). Preaching universal inclusiveness and appealing to all to join in worship. He sponsored popular social programs and band concerts that attracted large audiences. 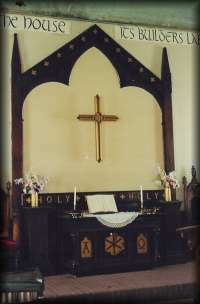 In 1895, with the arrival of W. T. Jordan, the church was known as the "Peoples' Church" and because of his wood working skills, the inscription "Be Ye Holy, For I Am Holy" graced the alter for many years. Rev. George Eaves continued the "Peoples' Church" designation through his tenure. He instituted a children's sermon on Sunday mornings. Community involvement marked the ministry of J. Challen Smith, who in the winter of 1903-04, led the drive to bring the Carnegie Library to Silverton. F.E. Carter's community involvement was very different. He was a member of the Vigilance Committee in 1908 and had a running feud with saloonkeepers. He opposed gambling and dancing in any form, making him very unpopular. Rev. Arthur Pink was probably the church's most famous theologian, going on to write books and treatises on Christian thought. Ralph C. Byers, serving our community from 1913 to 1919, possibly did more spiritually or all than any of the earlier ministers. He was particularly concerned for the youth of Silverton. Rev. C. H. Graves came to town in 1949 and immediately took on the gaming community. He alienated some church members and many others who were slot machine "entrepreneurs". Graves enlisted the District Attorney from Durango to come to Silverton while the slots were in action, thus forcing him to close down gambling in Silverton. Not a popular move! Tragedy struck in 1963, when Rev. Marvin R. Hudson, who had resigned as minister but still served, was commuting from Ridgeway with his two daughters. They were caught in the Riversides slide, burying the car in the bottom of the canyon, killing all three. Thus, the distinctive memorial on Highway 550. All those who have served, pledging to keep the doors open, now look to us who call this "our" church to preserve the sanctuary and parsonage for future generations. The 130 years of continuous service to this community speaks for the tenacity of our forbearers. Today we joyfully carry on the journey that was started those many years ago.